As a high performance strategist and trainer with Olympic medalists in two sports, lots of international and national champions and twenty years of experience, I thought I’d introduce myself to the golfers who read this blog so that you have an idea of who Trainer Bob Palmer is and what he has to offer as compared to most “off the shelf” books or programs on mental performance. I am a martial artist, a fourth degree black belt, and, while I love the game of golf, I am not a proficient golfer. Shocked? Well, I am also not a snowboarder, and one of my snowboarders won silver in Vancouver 2010. Nor am I a professional surfer and one of my surfers reached the podium recently in Australia at the Australian Open. I also don’t compete in Ironman competitions and one of my athletes recently had a podium finish in Brazil. I’ve worked with athletes for over a decade, from North America—Canada, USA and Mexico to India, Australia and Great Britain. What do they see in me? Great results, podium finishes, cash prizes and a reconnection with the fun of the game. …He thinks about shooting birdies and winning the club championship, but he read that this was the wrong thing to do and he remembers…one shot at time…process rather than outcome. He remembers to be positive and struts again and then he says, ‘I’m great-just shoot.” He remembers to calm himself by a deep breath that is a part of his pre-shot routine. He steps between the tee blocks and hits a nice butter shot that travels smack dab in the middle of the fairway. He struts again and tells himself, “One shot at a time,” but the club championship thought creeps in and he shuts it down by remembering to breathe. I don’t know about you, but writing that last paragraph exhausted me. That kind of mental approach, although typical, is way too much thinking and way too much to remember. But that is the kind of advice you get for your mental game, and I can’t imagine playing all 18 holes this way, or, for that matter, three or four competitive rounds—plus sudden death play. This kind of approach is not sustainable. Shooting each shot like it is the only one, using positive self-talk and trying to think positive are the fastest ways down the tubes in any sport. I know. I’ve worked with over twenty different sports. There has to be another, better way. And there is. All this confusion around the mental game was created by observations of professional athletes who often learned to be high performers with very little idea of how they did it. So they either make it sound easy—just do it—or difficult—it is a lot of hard work—without actually giving any strategies on how to get there. 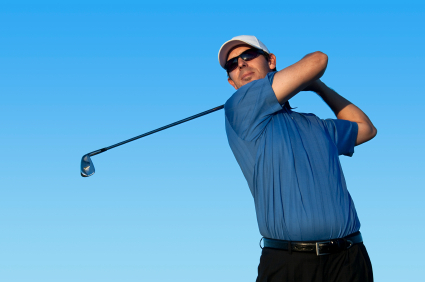 It is actually quite easy to improve your golf game, if you follow one basic rule. It is… don’t think. Following all the “thinking” advice of various books will exhaust you. It might work for a round, but you will start thinking so much it’ll affect the technical side of your sport—stance, grips, yardage perspective, putts, etc. I’ve been teaching a non-psychology, non-thinking approach for more than twenty years and athletes in many, many sports have put my system to the test. One is Daley Byles, a young athlete playing Division 1 golf. He has put my system to the test. He told me that he was already using the types of tools I was teaching him, but my system allowed him to use them sooner, to refine his game and to have no doubt as to whether he was in his high performance mode or not—without thinking. I have to apologize for such a short paragraph for Daley, as he is intelligent and he does have a lot to say when he is off the tee. Rather, his routines are so ingrained that he does no conscious thinking when on it. None. And to him, sometimes it even seems like he is along for the enjoyable ride and that his body is just a ball-hitting machine. No deep breathing, no self-talk, no being positive. He just IS and he DOES consistently par holes. If you find this in any way interesting, I suppose that you’d like to learn to be a hitting machine like Daley. Well, stay tuned, as you are about to find out with some of the strategies that make my system so powerful and easy to use. In the next article, I’ll get you started and teach you how to NOT think, right from the get-go in on the first green. In the interim, enjoy your golf, and I look forward to helping you to improve your game. This entry was posted in Athletes, Golf, Mental Training and tagged Athletes, competition, golfer, golfing, High Performance, mental game, Sport, training. Bookmark the permalink.